BREGUET REF. 3290 YELLOW GOLD Breguet, No. 4860, Ref. 3290. Made in the 1990s. 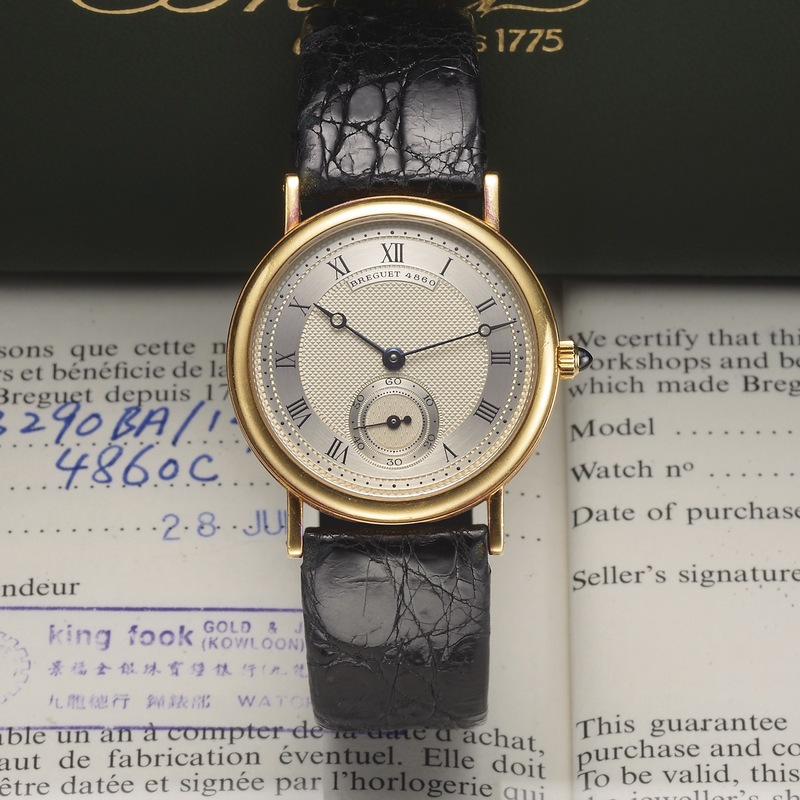 Very fine and elegant, thin, 18K yellow gold wristwatch with an 18K yellow gold Breguet buckle. Accompanied by the original fitted box, hang tag and booklet. Three-body, solid, polished, snap-on case back, engraved with concentric guilloché ring, reeded band, straight lugs, screwed bars, cabochon sapphire-set winding-crown, sapphire crystal. Two-tone guilloche champagne and silver with painted radial Roman numerals on a plain reserve, outer minute divisions, subsidiary seconds dial. Blued steel Breguet hands. Cal. 818/4, rhodium-plated, fausses cotes decoration, 21 jewels, straight-line lever escapement, monometallic balance adjusted to 5 positions, shock absorber, self-compensating flat balance spring. C. Three-body, solid, polished, snap-on case back, engraved with concentric guilloché ring, reeded band, straight lugs, screwed bars, cabochon sapphire-set winding-crown, sapphire crystal. D. Two-tone guilloche champagne and silver with painted radial Roman numerals on a plain reserve, outer minute divisions, subsidiary seconds dial. Blued steel Breguet hands. M. Cal. 818/4, rhodium-plated, fausses cotes decoration, 21 jewels, straight-line lever escapement, monometallic balance adjusted to 5 positions, shock absorber, self-compensating flat balance spring. Dial, case and movement signed. DIAM. 33 mm. THICKNESS 6 mm.